JEE Main II Admit Cards 2019 to be released by NTA at jeemain.nic.in: JEE Main 2019 II Admit Cards are expected by March 20. The Admit Card can be downloaded from JEE (Main) website. The candidates are advised to download their admit cards from JEE (Main) II website only. NTA is scheduled to organize the JEE Mains 2019 Examination across the country for candidates seeking admissions to Undergraduate Engineering Programmes in NITs, IITs and other Centrally Funded Technical Institutions (CFTIs). Candidates must keep a tab on the official website to download their Admit Card as soon as it is uploaded by NTA. A help desk will also be set up and Candidates will be able to call the same from 9.00 AM to 5.30 PM. National Testing Agency, NTA would be releasing the JEE Main 2019 admit cards on the official website on March 20, 2019. Candidates who have applied for the examination are advised to keep a check on the official website, jeemain.nic.in for important updates. JEE Main 2019 April examination dates have been announced after revision. Due to Lok Sabha Elections, JEE Main 2019 April examination would not be conducted on April 11, 2019. Instead, they would be conducted on April 8, 9, 10 and 12. JEE Main 2019 Paper II would be conducted in two shifts on April 7, 2019. Information regarding the date assigned to the student would be made available on the admit card. JEE Main 2019 is being conducted twice this year by the NTA. The examination is completely in computer based test mode and being conducted across multiple slots. The final score would be normalized. For candidates appearing in both the January and April examination, the better of the two NTA scores would be considered for Final Ranking, to be released by April 30, 2019. JEE Main 2019 exam pattern: The duration of the exam is for three hours and the questions are from mathematics, physics and chemistry based on class 11 and class 12 syllabus of CBSE. A total of 30 questions from each subject will be given and each correct answer carries 4 marks and where as each incorrect answer carries -1 mark. Around 1.2 million students are writing this exam every year. Paper-1 of JEE Main 2019 will be held through online or offline mode. A candidate will opt for any of them. It will carry questions from chemistry, physics and mathematics subjects. A total 90 objective type questions will be asked carrying equal weightage for all subjects. Each correct question will carry 4 marks and 1 mark will be deducted for each incorrect response. Paper 2 of JEE Main 2019 will be conducted for admission to undergraduate architecture courses and the test will be offline only. JEE Main Paper 2 consists of three parts which are mathematics, aptitude test and drawing test. It carries a total of 50 questions for aptitude test, 2 questions for drawing test and 30 questions from mathematics. The exam duration is three hours and the marking scheme is same as paper 1. The National Testing Agency (NTA) has declared the JEE Main 2019 II April Examination dates. As per the notification released on the official website of the exam - jeemain.nic.in - the examination for JEE Main 2019 II will be conducted between April 07, 2019, to April 20, 2019. Since Election Commission of India has declared the dates for General Election on 11th, 18th, 23rd and 29th April 2019 as well as on 6th, 12th and 19th May 2019. Accordingly, the Dates for the JEE (Main) II April 2019 is hereby announced as under: Paper-2 (B.Arch./B.Planning) will be held on April 7, 2019; and Paper-1 (B.E./B.Tech) will be conducted on April 8, 9, 10 and 12. The NTA also announced that the JEE Main II Admit Card 2019 for April examination will be uploaded on the official portal of the examination - www.jeemain.nic.in - on March 20, 2019. The students who have applied for the JEE Main April 2019 examination can see their exact date and shift of exam from their respective Admit Cards. For more details, the candidates are advised to visit the official portal of the examination. The link of the official notification released by the NTA is provided below for the reference of the candidates. The admit card for the Join Entrance Examination (JEE) Main is expected to be released soon by the NTA at the official website – jeemain.nic.in. All those candidates who have registered for the same are required to download their respective cards from the website itself, once released. JEE is conducted annually to select students for admission to various technical institutions across the country. The admit card contains important details like exam centre, time, name, date of birth, gender, state code of eligibility and category. In case of any discrepancy, communicate to JEE (Main) Secretariat/ CBSE immediately for necessary action. Students need reach the examination venue at least two-and-a-half hours before the start of the examination. 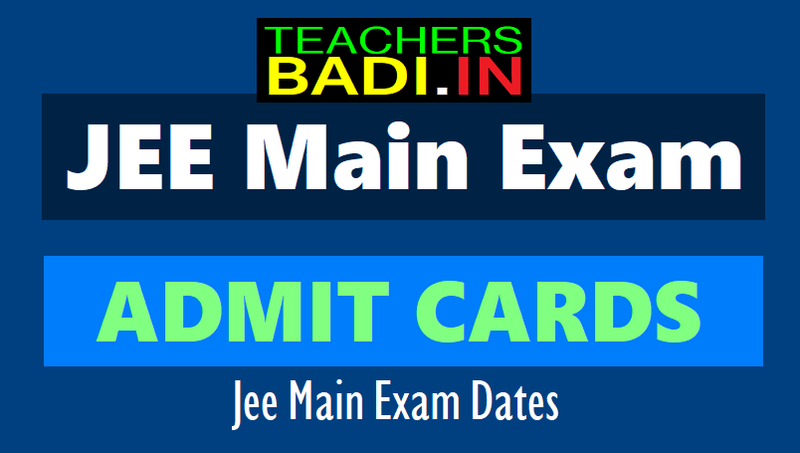 The admit card of the JEE Main exams has been released. The students who will appear for the JEE Main exams can download the admit card through the official website, nta.ac.in, by providing their application number and password or application number and date of birth. Students are reminded that the exact date and shift timings allotted to them have been made available on the official website jeemain.nic.in. In case they have not checked the same, they are advised to do so now. While exam date, shift and city information has been released, the examination centre information would only be made available on the admit cards, when released on December 17, 2018. As a special consideration, applications of candidates whose photographs did not have the mandated name and date are also accepted. All such students are also advised to download their admit cards from the website jeemain.nic.in. NTA may or may not send the notification on your registered mail Id regarding the release of the admit cards. Candidates and their parents are hence advised to keep a check on the official website jeemain.nic.in for any updates and news. Once released, students and their parents are advised to download the admit cards at the earliest to check the examination centre allotted to them. They are advised to save a copy of the admit card and also take a print out. Instructions regarding the examination would be available on the admit cards. JEE Main 2019 would be completely computer based test and conducted in January and April 2019. Students can appear for either or both of the examinations. In case the students opts to appear for both January and April sessions, the better of the two scores would be considered for JEE Main 2019 ranking. Results for JEE Main 2019 January Examinations would be released on January 31, 2019. JEE Main I 2019: National Testing Agency, NTA is scheduled to release the admit cards for Joint Entrance Examination, JEE Main I 2019 on December 17, 2018. The admit cards for the examinations set to begin from January 6, 2018 and January 20, 2018 would be released on the official website jeemain.nic.in. Candidates who have applied for the engineering examination are advised to download the admit cards as and when released. 5 Important things regarding the JEE Main 2019 examinations are summarized below for quick reference. JEE Main I 2019 Admit Cards to be released on December 17 on jeemain.nic.in: National Testing Agency, NTA would be releasing the JEE Main 2019 admit cards on December 17, 2018. The admit cards for the January examination would be released on the official website jeemain.nic.in. Students who have registered for the examination are required to download the admit cards from the official website. Important dates and updates for JEE Main 2019 January examination are provided below for reference. Students and parents are advised to note that NTA may not send any notification regarding the release of admit cards. Candidates are required to keep a check on jeemain.nic.in for updates regarding the examination and downloading admit cards. Examination Date, city and shift details are available on the official website. Students to please note that the date for release of admit card is subject to change. As per the initial notification, the admit cards would be released by December 17. Any update regarding the admit cards, if released, would be made available here as well. Candidates must check Important Details given on the Admit Card and get in touch with the competent authority to get it corrected in time, "Please check the Admit Card carefully for your Name, Paper, Date of Birth, Gender, Test Centre Name, City, State Code of Eligibility and Category. In case of any discrepancy, communicate to JEE (Main) Secretariat/CBSE immediately for necessary action," read a guideline. Also, candidates must reach at least 2½ hours before the time of exam as given on the Admit Card, to ensure frisking and registration formalities. Details like the examination center, schedule, and roll number for the examination would be available on the admit cards. Please note, NTA would not be sending any notification to the registered mail is about the release of the admit cards. Candidates are required to themselves keep a vigil on the official website jeemain.nic.in for any information pertaining to the examination. Updates on the same would also be available on this page. NTA would be conducting JEE Main 2019, which is the entrance examination for admissions to top technical institutes of the country like NITs. The JEE Main 2019 ranks would be used for admission to NITs and IIITs. As for the top engineering colleges – IITs, the admissions would be on the basis of JEE Advanced 2019. The forms for JEE Advanced would be released after the declaration of JEE Main 2019 results in April. JEE Main 2019 ranks would be used to check the eligibility of candidates to apply for JEE Advanced. Join Entrance Examination is held in two stages..
JEE advanced which is held by a different IIT every year. The JEE Main exam will take place from January 6 to January 20, 2019. A score of at least 75 per cent in class 12 board exams or a place among the top 20 percentile of the Boards is required to be eligible for JEE main or advanced. For candidates of the SC and ST categories, this has been lowered to 65 per cent. The candidates are advised to visit the examination center a day before the conduct of examination to know the exact location of the center to avoid any delay in reporting at the examination center as per schedule. No candidate will be allowed to enter the examination hall after the time of last entry (i.e. 9.30 AM for Paper-I, 2.00 PM for Paper-II and 2.30 PM for second shift of Paper-I). The answer keys and images of response sheets (OMR sheets) of the offline exam and answer keys of computer-based examination will be displayed on the website. The candidates, who are not satisfied with the captured response, may challenge by filling the online application form and paying a sum of Rs.1000/- per question The challenge of answer keys will also be accepted online only through the link available on the website on payment of Rs.1000/- per question.